The Wombat Anchoring System comes with a SoleMate, which is also made of lightweight composite nylon. 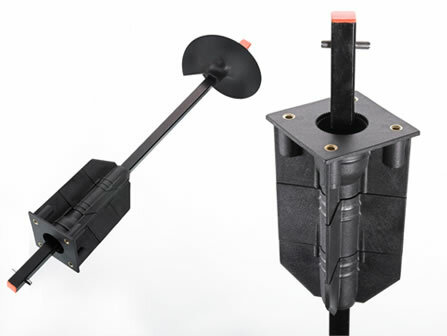 The SoleMate is an accessory made of a modular system of fins that slide over the shaft of the Wombat. They are pulled into the ground when the Wombat is screwed into the ground. Their purpose is to increase the the lateral stability of the Wombat shaft (giving it more resistance to sideways forces-the thicker the anchor, the more lateral resistance it has). This is simply achieved by increasing a 16mm wide shaft to a 75mm column. 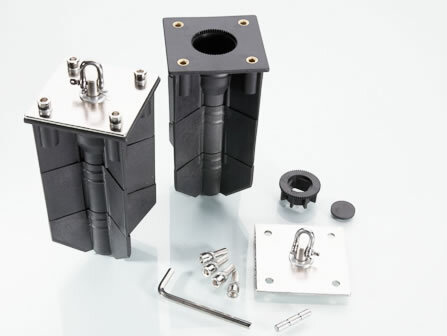 A swivel plate is supplied with the SoleMate.This allows loads to be taken at any angle. The SoleMate is quick and easy to use. Just slide it onto the Wombat shaft, insert the stainless steel drive pin and wind the wombat into the ground with the T-Bar.